The saying is, “You can always come home.” However, for some people that is not true. I never thought I would be afraid to come home, but because I fear losing my best friend, that is the case for me and my family. Three years ago, my wife and I moved from our home state of South Dakota to Oklahoma City, Okla., to go to law and graduate school. I recently earned my law degree and also hold a master’s degree in business administration. Ashton is pursuing her master’s degree in nutrition. 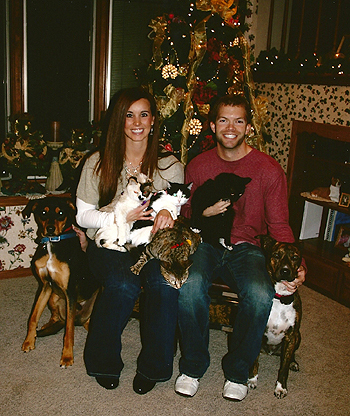 Our family consists of two dogs (Chip and Jeter, a.k.a. “our boys”), and three cats (Priscilla, Bella and Luci, a.k.a. “our girls”). When we first moved to Oklahoma, we had in the back of our minds that we would move back to South Dakota eventually. 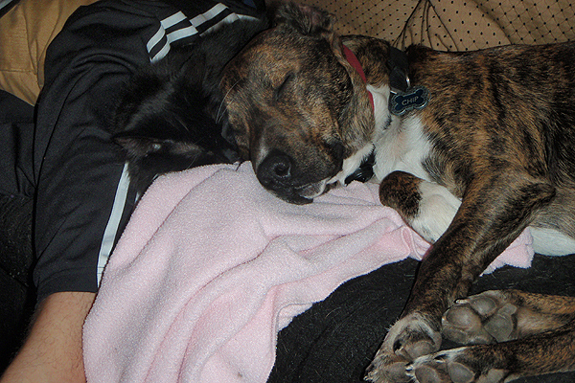 That changed when we acquired our pit bull, Chip. One reason why Ashton and I have made such a good couple is because of our equal love for animals. For example, all of our current pets are strays from the street. I found Chip in a gas station parking lot while I was on my way to class. We fell in love with him immediately. It didn’t hurt that he and Jeter were instant best friends and now inseparable. In addition, both Chip and Jeter get along very well with the cats. We have always been aware about the legal issues when it comes to breed bans, but we didn’t think about them much until we acquired Chip. Now, breed-discriminatory legislation is foremost on our minds. While researching breed-discriminatory legislation, I found out that some municipalities would not only ban Chip, but also ban Jeter, who is a Doberman and German Shepherd mix. I became immersed in researching and fighting breed bans when we were in South Dakota for a holiday, and I heard on the news that a certain South Dakota city had in the works a proposed pit bull ban. Hearing that a South Dakota town was going to vote on whether or not to ban pit bulls made me sick to my stomach. Luckily, this town was neither my hometown nor my wife’s hometown, but I understood that it very well could be one of our hometowns, and then what would we do? Our dogs come with us every time we go to South Dakota. I quickly found out that a few other South Dakota towns had been banning pit bulls for a while. One town in particular bans pit bulls, Dobermans, Rottweilers and German Shepherd dogs. It was at this moment I decided to devote myself to fighting breed-discriminatory legislation. Also at that moment, I felt fortunate to be living in Oklahoma. Oklahoma is one of 12 states that prohibits breed-discriminatory legislation. When I finished school, Ashton and I had the option of either going back to South Dakota where our family resides, or staying in Oklahoma. Making the decision was tough because we miss our friends and families that are in South Dakota, but on the other hand, we have started a life here of our own in Oklahoma. With that, we really appreciate the fact that our dogs are safe in Oklahoma. The counterargument to this is that I could always try to lobby my city council to not approve a breed ban, and I could also lobby the state legislature to propose and pass a bill that would prohibit breed-discriminatory legislation throughout the state. This is all true. However, I can also attempt those missions while in Oklahoma. If I have to fight a breed ban, I would rather fight from far away, rather than in the place I am living. If South Dakota eventually does enact a law prohibiting municipalities from enacting a breed ban, we would consider moving back there. Until then, it is just too risky. Another counterargument is that Oklahoma could retract its law prohibiting municipalities from enacting breed bans. Recently there has been a state legislator trying to do just that (thank goodness he has not been successful); however, when a state has on its books a law prohibiting breed bans, overriding that law is at least one more step that has to be accomplished before a city can enact a breed ban. What it boils down to is that when city leaders enact a breed ban, not only do they fail in making their communities safer, but succeed in killing many innocent dogs; they also are preventing good individuals and families, that will contribute positively to the community, from moving into town. 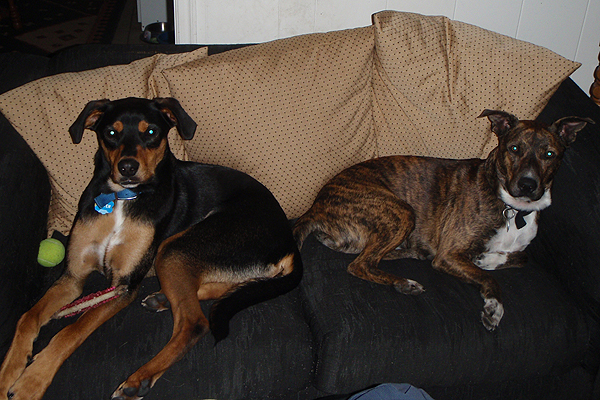 Irresponsible owners are the cause of dogs getting into trouble, not the dogs’ breed. Therefore, if city officials truly want to make their communities safer, they need to be blaming and punishing irresponsible owners, not blaming and punishing the breed. What a great family, – it’s good to know that they have their priorities right. I’m glad this young lawyer wants to fight breed discrimination, – this madness must surely be stopped eventually, – it’s borne out of ignorance / lack of understanding and has caused so much misery for dogs and owners alike. Breed bans exist only partially to ban certain breeds of dogs. The coded message of breed bans is to discourage “certain types” of dog owners from settling in certain communities. The popular perception is that “those people” (the poor, minorities, criminals) are more likely to own pit bulls. Nice middle class (white and affluent) families are perceived as being more likely to own Labs, Goldens, Poodles, etc.. Banning people from living in your community is, of course, illegal. However, banning “dangerous” dogs is viewed as responsible public policy. Until breed specific legislation is discussed honestly we will continue to see the proliferation of these seemingly irrational laws. @LisaHarperShaffmaster So true Lisa, that’s why we are all hoping to change the conversation concerning pit bull type dogs. I know how you feel. It would be nice to move closer to opportunity and friends, but because of Denver’s barbaric BSL, which now includes several outlying metro areas, I will not be moving. I am not putting my pit mix in harms way. The choices are harder where I live, but worth the sacrifice. The thought I have on BSL is that it is a direct result of the failure of our society as a whole. I also live thousands of miles away from Denver, where my boyfriend works. He pays to fly home each weekend so my Pit Bull type dog is safe. @MonicaDangler So sad that you have to make such sacrifices to keep your baby safe. If you want to share your story with us, we would love to post it on this site. If you’re interested please email [email protected] and send us photos too! @[email protected] I would love to hear that story…. Great family! Go get ’em Mr. Lawyer. We need more of you around and involved!!! Love the stand you have taken! Thank you for sharing your story. I know it is hard to be away from your blood family, but doing so to keep your furry family safe speaks volumes. I’m glad you are a lawyer and that you are joining the rest of us committed to overcoming breed specific legislation. I hope you start a blog where you can continue to share your experiences and where we can stay in touch with you. Please give all your furry kids big pats for me and my pack. Thank you for sharing your all too familiar story. As a pit bull advocate for the last five or six years I’ve been on a letter and e-mail campaign to everywhere I’ve heard of around the world that is considering a breed ban or breed restrictions of any kind. While there is no way to know if the verifiable data on pit bulls that I always provide helped sway them toward non-breed specific animal control laws or not at least I know I’m doing something. Fighting these misinformed people is futile, however perhaps educating them is more effective. this last year I had an opportunity to do something concrete here in Portland Oregon where I live and since February have been having monthly Bully Walks through downtown Portland. 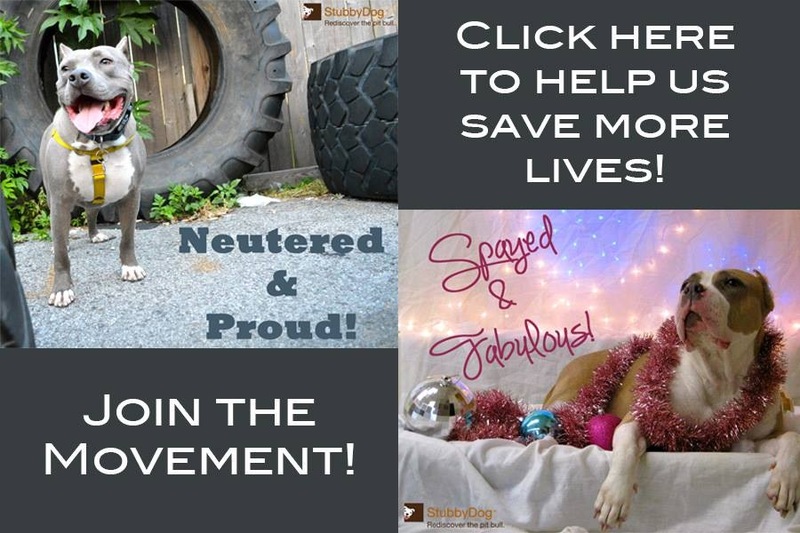 From these walks an advocacy was formed; The Portland Pit Bull Project. The purpose of our walks is to show ordinary citizens, just like us pit bull owners, what the media won’t show them and that is that we pit bull owners are no different than they are and that our pit bulls are no different than their dogs when in the hands of responsible pet owners. We are slowly evolving into quite an advocacy and in the last few months have taken donations for local shelters and rescues on our walks as well as invited local shelters and rescues to bring their pitties needing homes to walk with us. We are very proud to report that we’ve introduced three pit bulls to their forever families through our walks. We not only want to advocate for pit bulls but we also want to benefit all dogs in need in the name of pit bulls as well. We also have pit bull education booths in every dog related community event we are able to. While taking legal action may not be something that is necessary at the moment where you live perhaps you might want to consider a grass roots movement of local pit bull owners and organize Bully Walks of your own. It is my heartfelt opinion that we pit bull owners can ‘tell’ others who don’t know pits and don’t want to know them how great and how perfectly safe the vast majority of pit bulls are until we are blue in the face and we may never crack open one of those closed minds a bit. BUT when we ‘show’ them they can’t help but second guess the information that they’ve been fed by the news media and those who fear and hate pit bulls. If just one person decides to find out the truth and changes their mind about pit bulls it’s worth every step. I wish the best of luck to you and please contact us should you want any tips or pointers on holding Bully Walks. You can reach us on Facebook at The Portland Pit Bull Parade or on our website at http://www.thepdxpitbullproject.com . Good on ya for using your legal talent for the good of pit bulls!